As climate crises threaten our home more and more frequently, British Columbians need to know — does the government have our back? As a teenager, I used to jog every day. Then, during one run, I got so sick, I stopped running altogether. The smoke was so thick that summer, I became physically ill from exercising in it. I grew up in the Okanagan. One of the epicentres of B.C. fire country. And because I have seen my community threatened by wildfire devastation, I know I got off easy. Stopping exercise is nothing compared to losing your home. I remember walking with a friend in 2003, her Kelowna neighbourhood recently returned from evacuation. Her home was thankfully untouched, but with guilt she showed me her neighbours’ houses. We stood out at the end of her driveway at dusk, a scorched children’s playground behind us. To our left, the silhouette of a brick fireplace stood out against the dark blue sky, to our right, only a driveway into the abyss. My family owned a horse farm. There is nothing scarier than an evacuation alert on a farm. At any given time we would have 40 horses on the property and with only a four horse trailer, it would be impossible to move them if a fire closed in. Besides, where would we go? My family was lucky to never have to make the choices that come with that situation, but given the experience of friends and family members in the horse community, it was always in the back of our minds. The Okanagan Mountain fire in 2003 threatened a lot of horse farms in Kelowna, including that of my aunt and uncle. I’ve heard stories of farmers who had to turn out all of their horses — mares, foals, stallions — into a field, turning the sprinklers on them. Some ranchers had just enough time to open their gates. So I guess it’s no surprise that I had a hard time reading about all the forest fires that have scorched land across our province, and the globe, these last few years — especially this past summer. And with the climate changing quickly, I don’t see reprieve in the years to come. I also had a hard time writing this piece. When I think about the possibility of losing my home, as many of our fellow British Columbians faced this past summer, an innate nauseous, panicky feeling bubbles up in my stomach. It’s probably what a rabbit feels while being circled by a hawk — I want to seek out shelter, but there is no refuge to be found. After a childhood of collecting items for displaced families in neighbouring communities, and lending out our guest room and horse stalls to distant relatives needing sanctuary, it is far too easy to imagine being in the shoes of British Columbians escaping a wildfire. But this past summer, none of us could ignore the raging inferno that engulfed our province. Images that haunted my nightmares became a reality. B.C. faced a record-breaking fire season in 2017. Families were displaced, homes were destroyed and communities were ravaged. Pressy Lake is one example. Residents of the small community near 70 Mile House lost 33 houses to the devastating Elephant Hill fire. They were evacuated on July 29, but the fire didn’t reach the community until August 11, and residents are asking why, in those two weeks, nothing could be done to save their homes. Freedom of Information documents show the community had been assessed and a “laundry list” of firefighting equipment was made ready, but none was deployed. When questioned on the response, or lack thereof, the government said an investigation into the situation is forthcoming. What’s smouldering under the surface? The provincial government response to this year’s wildfire epidemic will be reviewed in an independent investigation. But to get to the bottom of what’s really going on, the investigation’s scope should actually look further into the past than just this last year. For decades, the Martin Mars, based in Port Alberni, was the province’s main weapon against wildfires. In use for 53 years until it was shelved in 2013, the plane was the world’s largest aircraft of its kind, with the ability to pick up more than 27,000 litres of water and a 600 kilometer flight range. It could knock out a fire fast. Why was the contract terminated in 2013 with Coulson Group, who owns the iconic plane? The BC Liberal government said it came down to dollars and cents. Steve Thomson, MLA for Kelowna-Mission and the minister responsible at the time said there “are more cost-effective, efficient options available due to advances in airplane technology. But what if the decision was made for another “dollars and cents” reason? 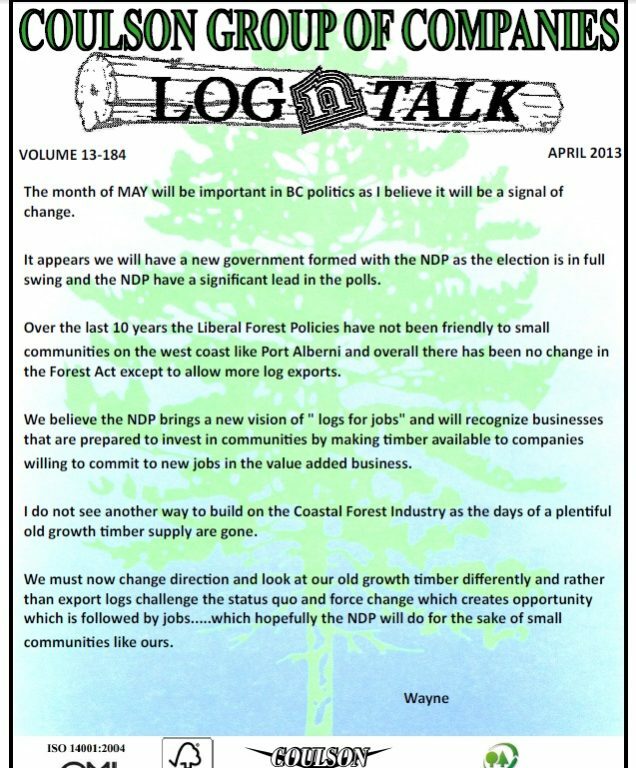 In the lead up to the provincial election in May 2013, Wayne Coulson, the owner of Coulson Group, came out strongly against the BC Liberals’ forestry management policies. The BC Liberals went on to win that election and promptly cancelled the contract for the Martin Mars. Coulson Group was excluded from the subsequent bidding process. Which company did the government choose to award a contract to instead? Major BC Liberal donor, Conair. From 2005 through 2013, Conair Group had donated more than $98,500 to the party, $7,500 in the days leading up to the May 2013 election. By contrast, Coulson Group had donated less than $8,500 in that same time frame, giving nothing in 2013. More than donors, key executives at Conair were tight with the BC Liberal government. Jeff Berry spent 36 years of his life in B.C.’s Forestry Service and was the head of British Columbia’s Airtanker program from 1996 through 2013. His job was to award the contracts for fire fighting water bombers in B.C. In 2013, he left that job to join Conair. In 2015, the Martin Mars was brought out of its mandatory retirement to fight wildfires. The government awarded a one-month contract to Coulson Group for use of the aircraft. 2017 was a worse year for fires in B.C. — the worst since record keeping began in 1950. But yet, this year, the Martin Mars stayed grounded. In July, Coulson Group reached out to offer its services. The Martin Mars could be ready for battle in August, but the company also offered immediate use of helicopters that were the only fleet approved in North America to fly at night, which could have immense impact on fighting the fires. But the government — still the BC Liberals at that time — turned Coulson down. If a petty partisan fight resulted in the loss of hundreds of homes, including those at Pressy Lake, we deserve to know. Will this wildfire investigation tell us that? Will it look into the deeper causes of how and why crucial decisions were made? Not without a specific mandate to do so. It’s time for government action to stop the climate crisis from getting even worse. Halting Big Oil’s impact on legislation to address climate change is one part of it. Stopping future fossil fuel infrastructure projects, like Kinder Morgan and U.S. thermal coal facilities, is another. But with more and more fires ahead for B.C., we now need our government to be better prepared than ever to respond to these disasters. B.C.’s fire season is only going to get worse as we face the unprecedented perils ahead. As British Columbians attempt to clean up yet another climate catastrophe, we need to make sure Big Money isn’t simmering in the embers. We need to know our government is on our side. Our lives, and our homes, depend on it. And for me, a child of fire country, this is personal. I don’t know everything about the Martin Mars planes but what is said is they are too cumbersome and more water can be placed with the smaller skimmer planes. One thing I know from experience is wild fires are not stop able without the right weather… This summer was a different weather pattern than any I have know. The real wet period early on set the stage for much more grass to carry the fires and the extreme heat for so long made it impossible to stop fires once greater than an acre. The weather pattern caused a huge hurricane in Cabo San Lucas and extremely dry hot weather coming up the whole coast to Prince George. This pattern lasted longer than ever before. My reasoning is ozone depletion mainly around Southern California. There used to be a NASA map for Aug and Sept of the US side of the earth. I can’t find it anymore. That map showed extremely thin ozone over the west coast land mass and over much of the North Atlantic. When I looked recently all I could find was the South Atlantic/Antarctica. The hole that was shrinking a couple of years ago is much larger. The other thing I noted on the summer map was high density ozone over Siberia. Few jet planes or rocket engines fly in Siberia but many leave LAX and many cross the Atlantic also since the space shuttle was shut down the ozone over the South Atlantic got better till the last year or 2 with Spaces and others sending oxygen eliminators through our stratosphere. Ozone is being killed by industry and the oxygen needed in the stratosphere to replace it is being burned up. 30% more sun energy is huge. Carbon is bad but this is compounding the carbon problem. Wild fires make enormous amounts of carbon dioxide to add to coal and oil. To me it is a clear picture. Monsanto Monsanto Monsanto MAKES THE RETARDANT!